It began to rain off and on and was rather cloudy. 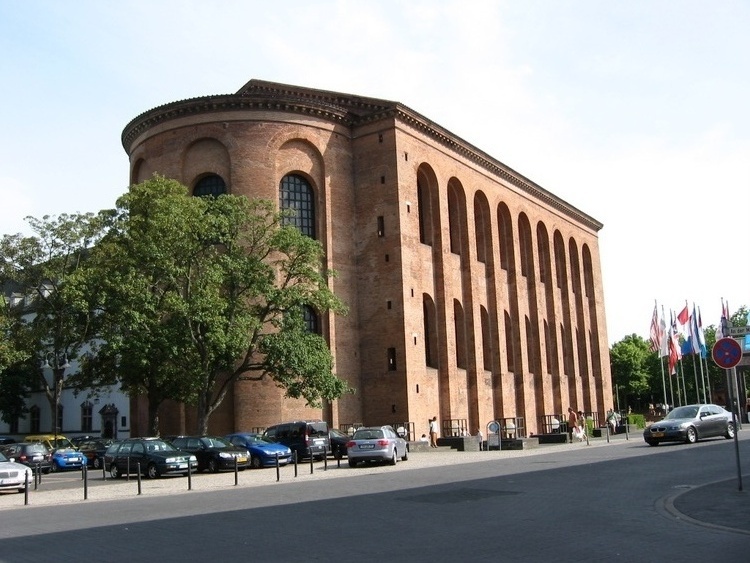 We walked to the Roman Basilica. 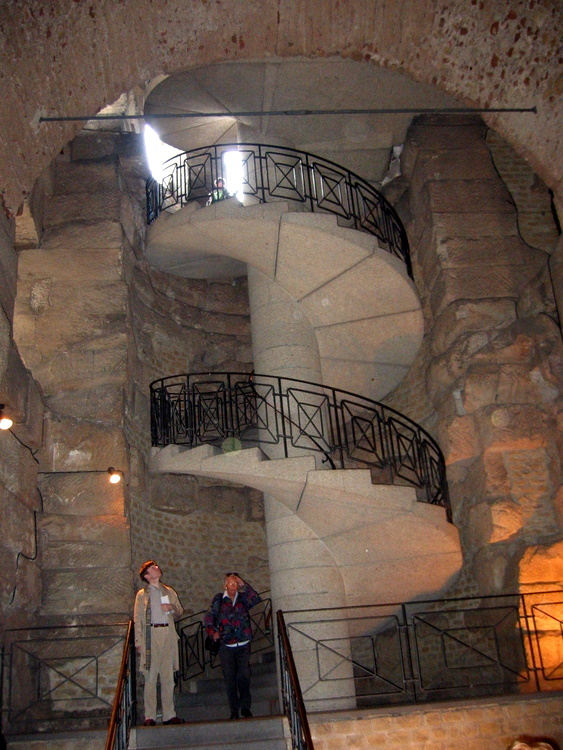 It dates back to Constantine with some of the original walls. It consists of one huge rectangular room. 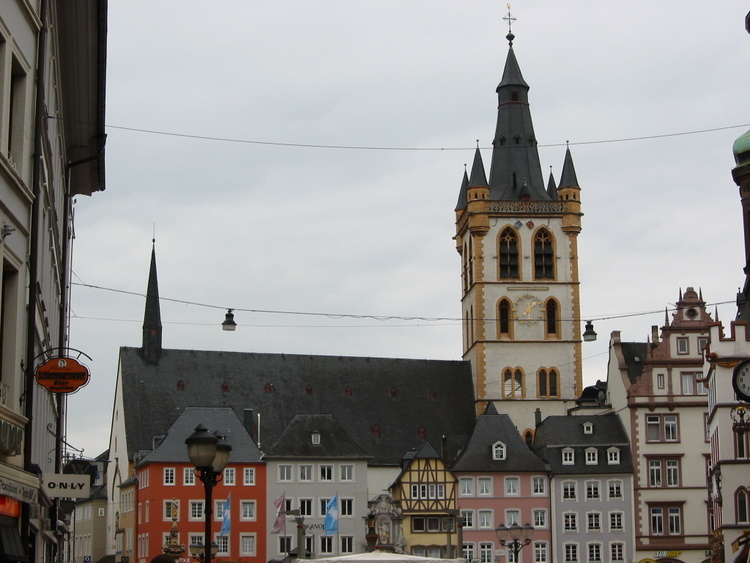 It is used now as a Protestant church. 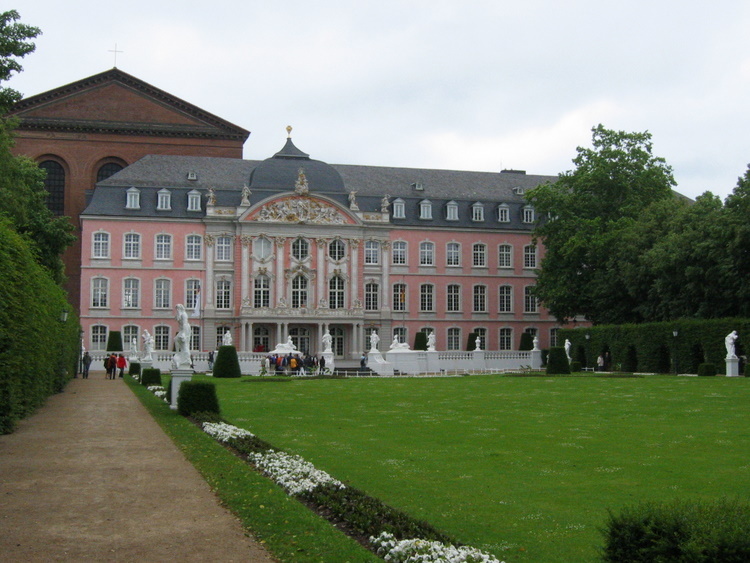 From there we saw the Royal Palace and its gardens. We walked back to the square and went to St. Gangolf church. 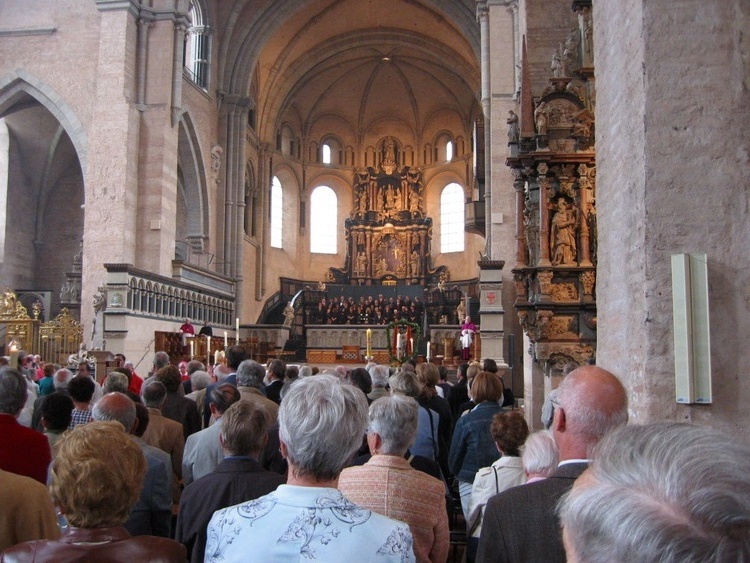 The present church was begun at the beginning of the 15th century. A fo ur-story tower had alre ady been constructed a century earlier. It was 200 feet tall, taller than the Dom’s. 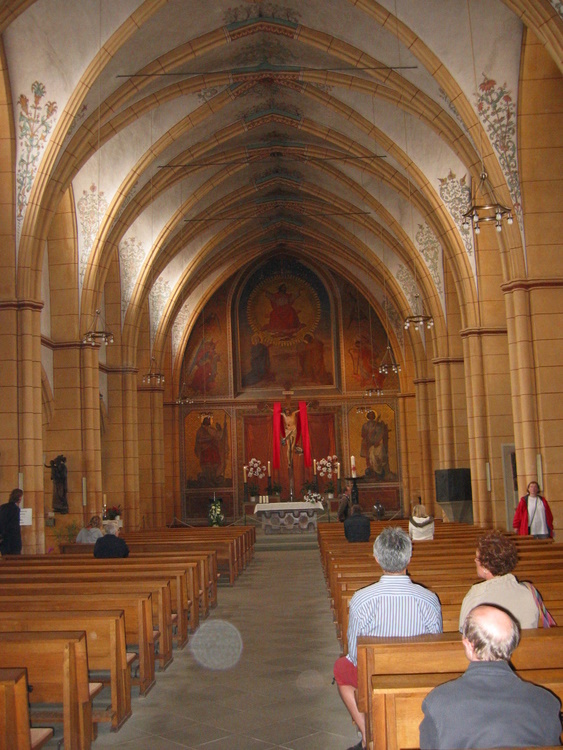 The interior is a Late Gothic color scheme. We then stopped in a café for coffee and afterwards found a McDonalds for lunch. 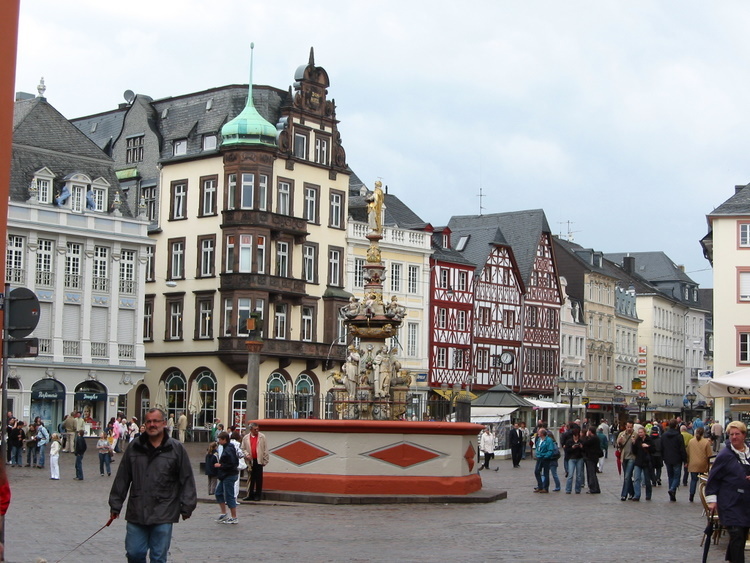 It was in the mid dle of the square in an old building with a turret( building below with green turret and brown facade. McDonald’s tasted good. The Germans serve a heavy meal for lunch, and we wanted a quick meal. The sun came out and we decided to take a sight- seeing bus tour. We met a couple from Holland who had a child of friends with them. They were camping in a caravan. We rode on the top deck of the bus. 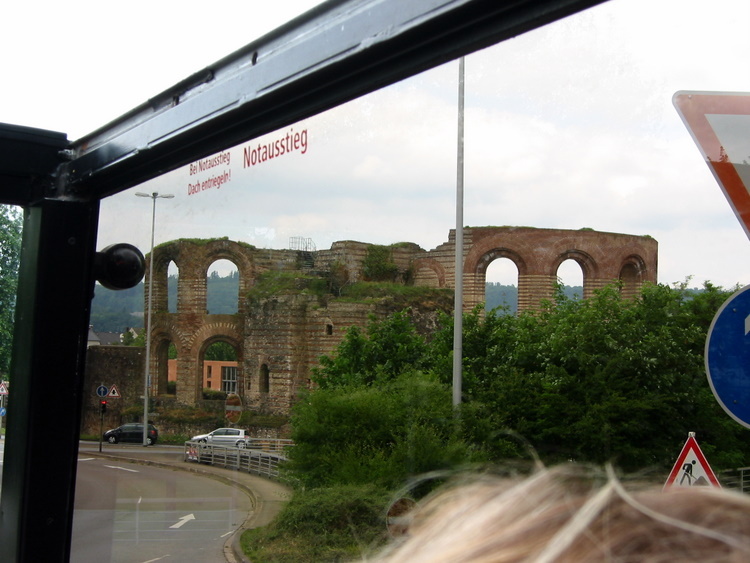 We saw the Roman baths, coliseum and we sat up high for a good view of the city. My wife went back to our room for a rest, and I climbed to the top of the Porta Nigra and got some wonderful photos of the old town. 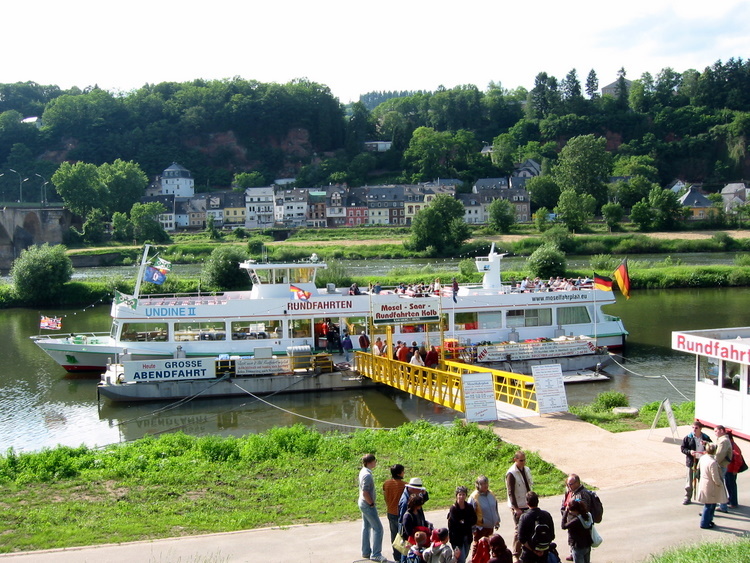 My wife, now rested, decided she would like to take a ride on the Mosel River which was a short walk from the hotel. The boat ride was a little over an hour and most enjoyable. When we landed we found several outdoor cafes along the river. My wife had a strudel and coffee and I had a beer. We walked back past our hotel to see two other churches. St. Maximin was closed. A few blocks away was St. Paulin. We notic ed a lot of cars parked on the street near the churc h. We walked in and found the church packed, chairs in the aisles and people standing around the wall. We got in on the beginning of a Bach Mass. There was a full orchestra and a large choir. 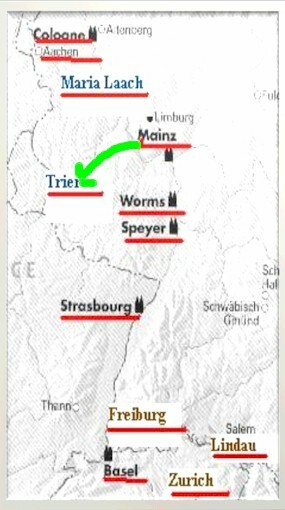 It also was a full service with a 15 minute sermon in German. We heard the word Pentecost several times. 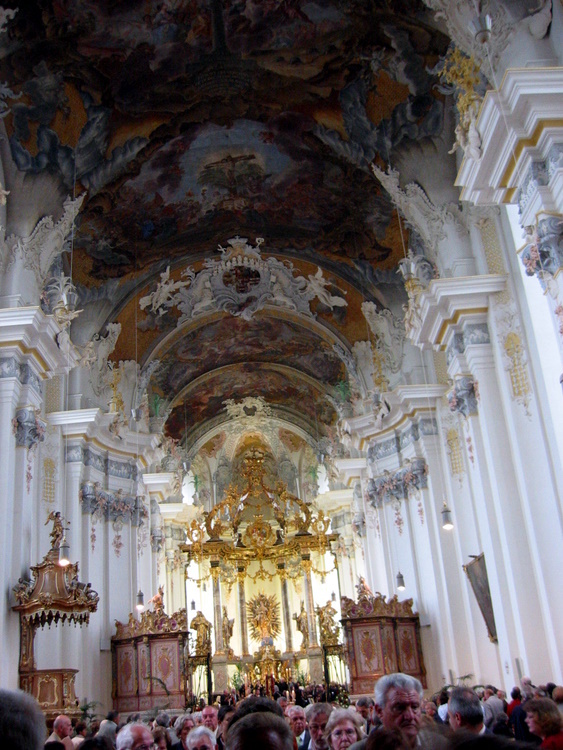 The church itself was very baroque. 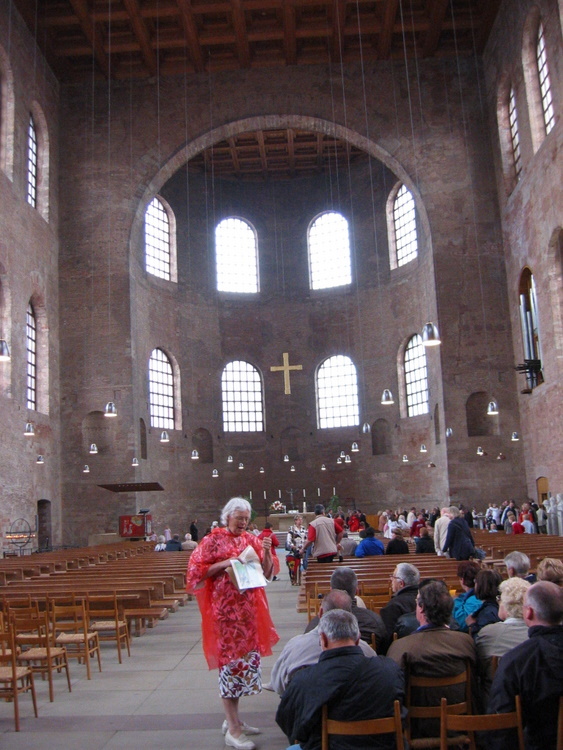 St. Paulin was erected in middle of 18th century. 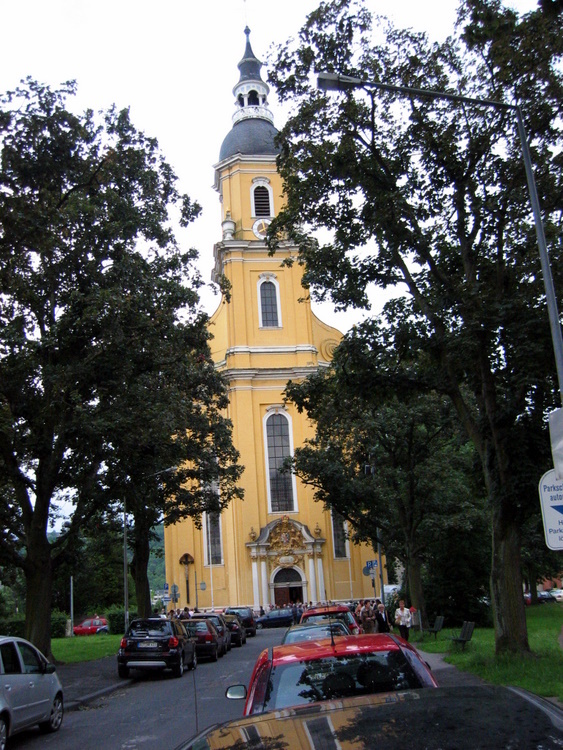 It is Baroque church designed by Balthasar Neumann. 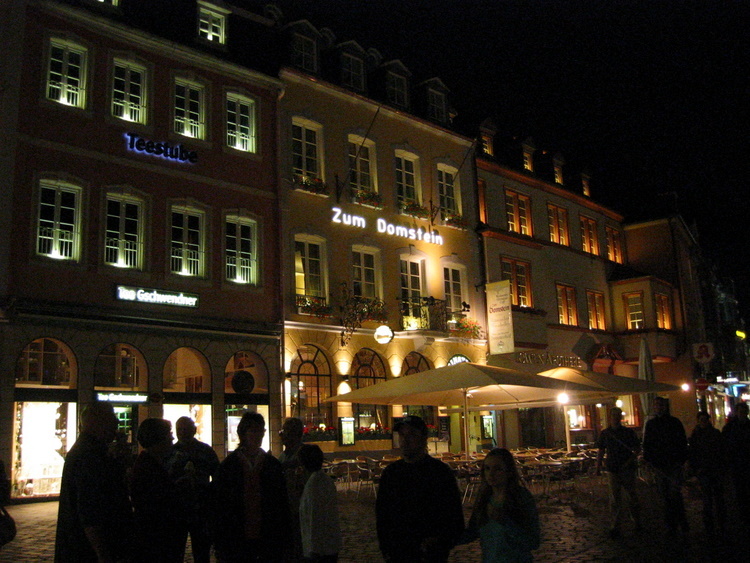 We then walked back to the hotel for a drink and then back to the square where we ate at the Zum Domstein. They had wine tasting on the menu. They brought three different Reislings each. We had shrimp baguette and salad for a shared starter. I had a pork cordon blue with green beans, carrots and French fries. My wife had an onion tart. We ate in an awning covered back outdoor café. 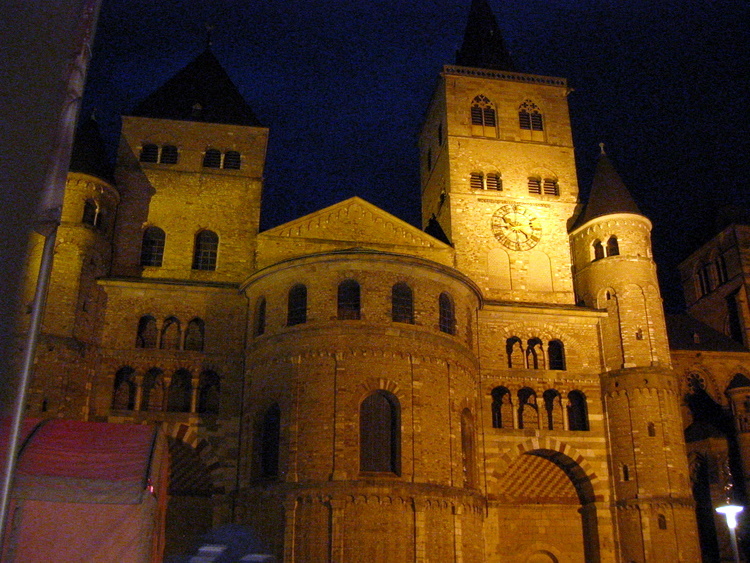 When we left we went out the backdoor and found we were right in front of the Dom. 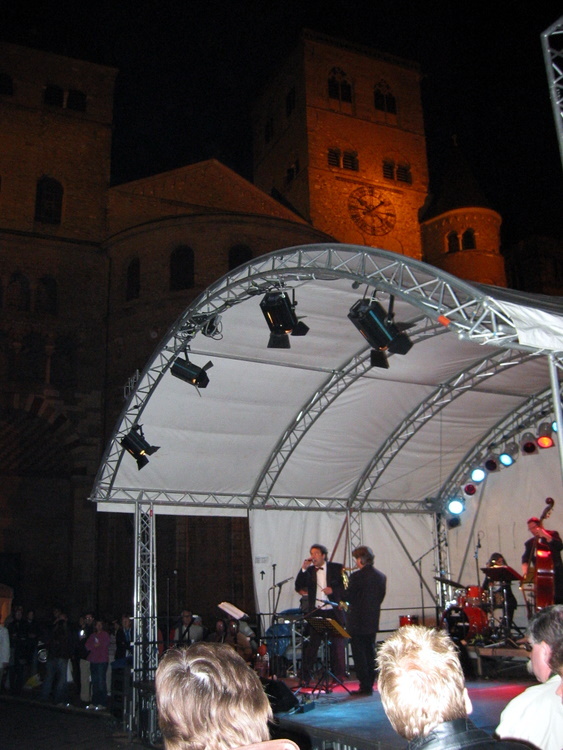 All weekend there had been a big tent in front and to the left of the Dom where there was live music. We stopped to listen a while and heard “Isle of Capri” and “Bad, Bad Leroy Brown”. My wife wanted to dance. On our way home, we stopped and got gelato cones. It started to rain. It is hard to have to eat dinner at 10:00 but the Germans seem to eat late.